Almost a decade passed. His back healed and my life regained its meaning. One fall, we were surprised to see a few pecan-sized oranges on it, bitter fruit, all seeds and pulp. The next spring we looked for flowers and were rewarded with a few white blossoms the size of a small pea. 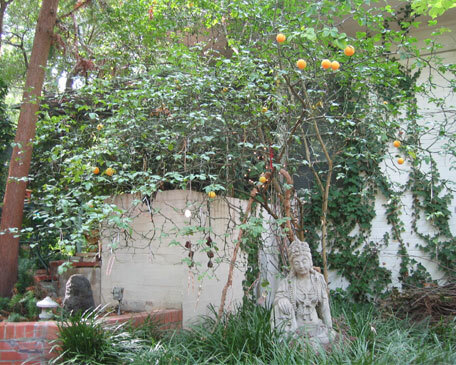 But it wasn’t until a statue of Kwan Yin was placed beneath its boughs that the tree truly bloomed. The Chinese goddess of compassion sacrificed her place in Shinto heaven in order to feel the pain of earthbound humans and help them to transcend. On this spring day, flowers bedeck every branch, beckoning of fruit to come. Dozens of colorful ribbons flutter as well, each one tied with prayerful intent by visitors. The Prayer Tree. Planted in the 1950s, the trifolate orange lived for decades before going through a period of extended darkness. Then in just a day, everything changed. Someone cared. It took years to rebuild, years when it seemed nothing was happening, but the blooms did come. Now it is not only reborn, it is deeply sacred, a living altar to the prayers of humans and a testament to faith in life. Spring is the reservoir of hope. Enjoy this season with its abundance of metaphors to live by and have faith in the life force that infuses every leaf, every stone, every grain of soil. At my rural place, the front meadow is an artificial field of Bermuda. The imported grass was overseeded on this piece of blackland prairie over 50 years ago. Until the mid-‘90s, the meadow was pummeled regularly by livestock or cut for hay. Yet through the pale gold straw of last year’s bermuda pierces the bronze stalks of bluestem, a native grass that flourished when buffalo grazed the land. For decades the seeds rested in the darkness of the soil. Then one spring, they sprouted.